Below you'll find word for word the original post I did on my old blog. This was originally posted September 2, 2009. I have decided I will do themed blog posts on Wednesdays and Fridays. 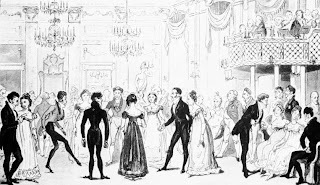 Today is Regency Wednesday, in honor of the fact that Almack's assemblies were held on Wednesday nights during the British Regency. I am not going to do a long post full of details. More along the lines of a simple explanation for those who may not know very much about the time period. I will start with the place that inspired me to use Wednesday as my "Regency" themed day. Almack's was a social club attended only by the crème de la crème of Regency Society. Located in King Street, St James, London, it was ruled by six or seven patronesses at any given time during the Regency. In 1814, they were Mrs Drummond Burrell, Lady Esterházy (who was Princess Esterházy after 1833), Lady Jersey, Lady Cowper, Lady Castlereagh, Lady Sefton, and Lady Lieven (who was Princess Lieven after 1826). To attend, one had to apply for vouchers at a cost of ten guineas. Eager attendees were allowed in only if they had one of these coveted vouchers. Being denied vouchers for any reason could ruin the social aspirations of the seeker. If one received vouchers only to lose them later, one may as well pack one's bags and leave London. The outer appearance of Almack's was nothing special but neither was the interior. The patronesses wanted the focus to be on the Society within, the people and manners, not the amenities. It was a social club to the core, a place to see and be seen. Dancing was the premiere entertainment at Almack's with gossip running a close second. Reputations were made and broken with shocking regularity. Almack's was an important part of Regency history. The famed novelist Georgette Heyer often mentioned it in her Regency romances. At times, she is even credited with having invented Almack's. It was a real place, however. If anyone has something about Almack's they'd like to share, please leave a comment. Even if all you want to do is point out where I've erred. *Dates were taken from the Wikipedia article Almack's. Next week I'll try to post new content, time permitting. Thanx for stopping by!